Before eating at Granger & Co, I had experienced Bill Granger’s restaurants only one other time. At the time, the trek into Surry Hills for breakfast was far to daunting to do on an empty stomach, and I therefore had to eat something before I left. This unfortunately meant I wasn’t super hungry once I arrived in Surry Hills, and thus only ate coconut bread. I realised my mistake when my breakfast companion ordered the Ricotta Hotcakes with Banana and Honeycomb butter, and it looked amazing. My coconut bread, as nice as it was, seemed to pale in comparison. Coconut Bread at bills, Surry Hills. About a year after this first experience, I was lucky enough to find myself in London, where Bill Granger has opened a restaurant in Notting Hill. I was absolutely determined that we go there at least once. It might seem odd to go to a restaurant in another country that serves similar if not the same food to the one at home. But after my previous experience, I thought that the opportunity to go there was not to be missed. Not only because the food is excellent, but the distance to get to Notting Hill was a lot less than the distance to get to Surry Hills at home! Thus more achievable on an empty stomach! On our first full day in London (yes, I was THAT keen), Mum and I caught the tube to Bayswater Station and took the short walk along Queensway and Westbourne Grove to reach Granger & Co. We were seated immediately, despite the restaurant being very full. Which was lucky, as I was obviously starving at this point! 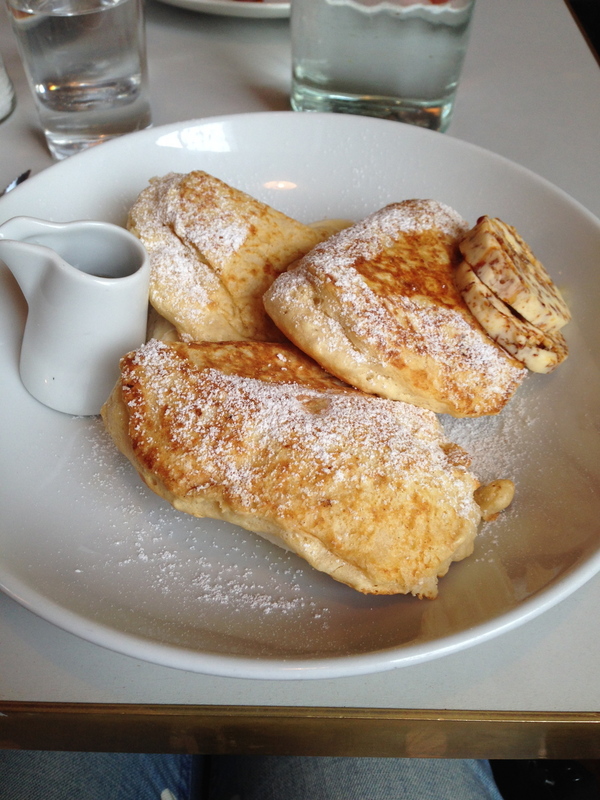 I had already decided I was going to order the Ricotta Hotcakes, and Mum ordered the Sweetcorn Fritters. Both meals were great, and according to Mum, the coffee ended up being the best she had on our whole holiday. Ricotta Hotcakes with Honeycomb Butter at Granger & Co, London. Once we were home I ended up finding the recipes for the Ricotta Hotcakes and the Sweetcorn Fritters. Both recipes work really well and are just as nice as eating them in one of Bill’s restaurants. The Ricotta Hotcakes are quite a decadent breakfast with the honeycomb butter, and would definitely be worth making for a special occasion. To make the honeycomb butter, place all the ingredients in a food processor and blend until combined. Using plastic wrap, shape into a log and leave to chill in the fridge. For the hotcakes, mix the ricotta, milk and egg yolks in a small bowl. Sift the flour, baking powder and salt into a larger bowl. Mix the ricotta mixture with the flour until just combined. Using an electric mixer and a separate bowl, beat the egg whites until they form stiff peaks. Using a large metal spoon, fold the egg whites into the batter in two batches. Be gentle whilst doing this otherwise the egg whites will go flat. Using the butter, lightly grease a fry pan. On a medium to low heat place two tablespoons of the batter per hotcake, and cook for about two minutes on the first side. The first side will be cooked when it is golden in colour and the top side shows some small bubbles. Cook on the other side and continue until all the batter is cooked. Whilst cooking the hotcakes, you might want to preheat an oven to about 100 degrees Celsius and place cooked hotcakes on a tray, to keep them warm. Serve hotcakes with cut up banana and a slice (or two!) of honeycomb butter. Original recipe can be found in ‘bills Syndey Food’ by Bill Granger (2000), p.22. Granger & Co can be found at 175 Westbourne Grove, London. bills in Sydney can be found at 359 Crown St Surry Hills and 433 Liverpool St Darlinghurst. *Update 11/10/14 - new bills Sydney location at Bondi Beach (79 Hall St). bills, 359 Crown St Surry Hills, Sydney.